Through Kleuren voor Volwassenen (Coloring for Adults) I received two super cute coloring books from Lantaarn Publishers (in English published by Michael O’Mara Books!) I’d like to thank them very much for that. The titles of the coloring books are A Million Cats and A Million Dogs. This review will concentrate on A Million Cats. 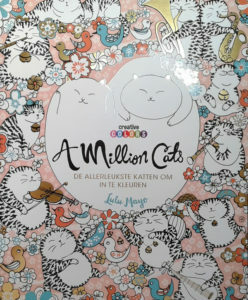 The book size is 21 x 25 cm and it contains 64 pages full of nice, whitty kitties in the weirdest situations and backgrounds. Flipping through the book I got enthusiastic right away. The drawings trigger so much mirth. Some drawings are very extensive and detailed, while others are simpler. To me the general feeling is that the drawings are playful and funny. The paper isn’t very thick, but thick enough for a coloring book to be able to enjoy the coloring. Because of the paper thickness I was curious whether fibre or felt tip pens would bleed through. The fastest way to discover this was to just try it out. So I picked the design on the last page and started coloring with the Stabilo 68 fibre tip pens. I like these pens very much. 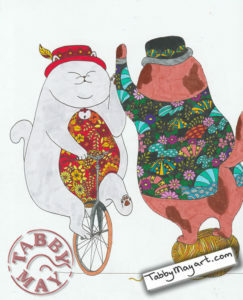 For the larger areas, especially the cat bodies, I’ve used the Tombow Dual Brush ABT pens. The Stabilo as well as the Tombows glided smoothly over the paper. And on the back of the page I could hardly see bleed-through. The little bit of hazy colors on the back of the page is very easy to camouflage. You could use pastel crayons or pastel pencils to colorize the background of that drawing. The rest of that design is virtually intact. The little bit that shines through will definitely be covered by whatever colors you put on the backside of the page. I liked to colorize this design. I just wasn’t too thrilled about the dark spots I gave mister Cat. But hey, I usually don’t colorize cats, so I got a bit out of my comfort zone. For the next design I took a for me quite unusual sidestep to pencils that I barely use. This one was colored with the cheap Chinese Marco Raffiné pencils. To be honest, I’d rather not use them. But I encounter them regularly in the online coloring groups and the results that people achieve and show are very often really nice. So I dug them up (figuratively speaking 🙂 ) and started coloring with them. I’ve chosen a very simple design of two cats. In my experience a mother and her kitten. At first I colored the flower drawings on the mother cat. I limited myself to using only purple and pink shades. But then I didn’t like the idea of a completely purple pink cat. So for the rest of her body I’ve chosen more natural colors. And so she became a tortoiseshell cat with spots in four colors. Five when counting white too. And I actually did color the white parts with a white colored pencil. After the biggest cat I had to colorize the little one. I’ve colored it with the colors of the first tomcat I can remember from when I was little. He was our pet about forty years ago and he was black and white and listened to the name ‘Moos’. In English you’d have to pronounce it as ‘Mose’, it actually was an abbreviation of ‘Moses’ haha. But I used to call him ‘Mosey’ (purposely written the way it’s pronounced in English 🙂 He was a super sweet animal. So now he’s been kind of immortalized in this colored drawing 🙂 . As you can see in the drawing above, I’ve made a frame around the two cats. Otherwise I thought it was a bit piteous and boring. The frame was made with a stencil and Faber Castell Creative Studio pastel crayons. As I usually do I’ve scratched a bit off the crayons with a sharp knife on a piece of paper, then applied it with a cotton pad. I’ve used two colors, dark and light purple. Oh and by the way, working with the Marco Raffiné wasn’t so bad after all. Well, they don’t color as light as the FC Polychromos or the Prismacolors. But using them just every once in while like I did now, wasn’t too bad after all. Especially considering the price I´ve paid for these pencils (€ 18,61 for a complete set of 72 pencils, shipping included). Since I usually colorize about three to four designs per review, I actually needed to do at least one more from A Million Cats. I’ve picked a design with no cats at all, but it contained a lot of Japanese umbrellas instead. 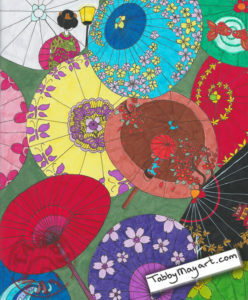 And those umbrellas were all drawn with several different designs. I figured this to be a nice opportunity to use a lot of colors. For the first drawing I’d used the Tombow Dual Brush ABT pens and because I liked that a lot, I’ve used them again for this last drawing. It became a cheerful and colorful picture and I enjoyed colorizing it very much. For the finishing touch I’ve given the black umbrella white lines. And the tree that’s on it was made white too. For this I’ve used the Signo Uni-Ball gel pen. 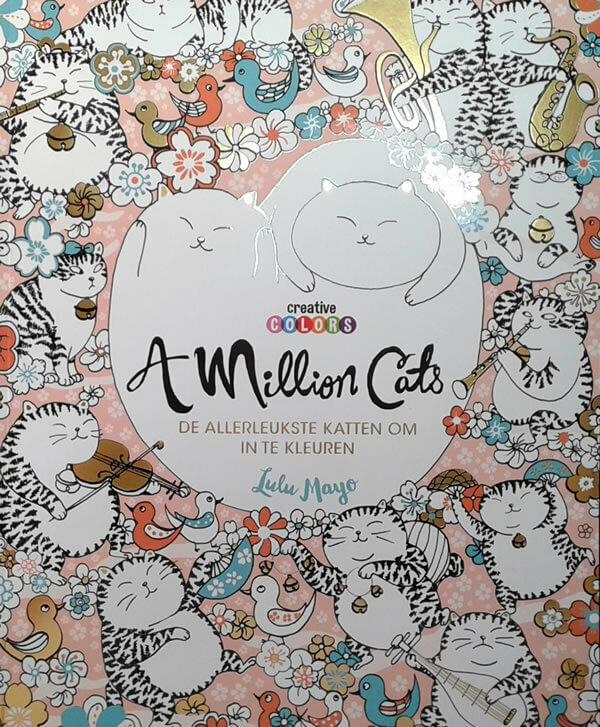 A Million Cats is a cute book. I’ve had fun coloring in it and there are more drawings that I would like to colorize. Especially the cheerful atmosphere of the designs appeals to me. It’s very inviting to use bright colors. And the cats are put in the weirdest situations, so even unnatural colors will suit them. 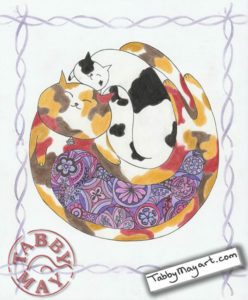 Do you love to color cats? Then this coloring book A Million Cats should be fun for you too! You can buy it for € 9,04 at Bookdepository by clicking here. Share this review on Facebook and Twitter if you like it. Thanks!